October 4, 1995, Newark's Basilica of the Sacred Heart. The day when Bl. 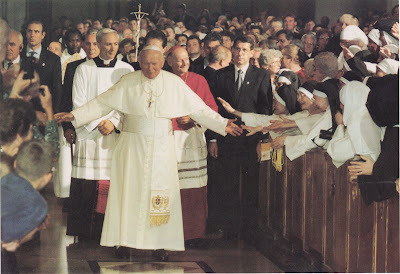 John Paul II came to visit the cloistered nuns in the archdiocese! And THAT is no an exaggeration! He said he'd come to Newark if we all met him at the Cathedral. You can see our Sr. Mary Antoninus, Sr. Mary of the Immaculate Heart and Sr. Denise Marie reaching out to touch him. Our two elderly sisters have since gone home to God. It was a very exciting day for them, especially for Sr. Mary of the Immaculate Heart who became a quasi-celebrity when, because 48 Hours did a story about us, people found out that she had been in the cloister for something like 65 years. Sr. Mary of the Immaculate Heart had a knee that would give out, so when she and Sr. Maria arrived at the Basilica, they decided that the easiest way to get to their place was, get this, through the front door! They ignored the security checkpoint and just walked right in past the police and guard dogs. Meanwhile, the rest of us where going through security and wondered where they had gone! The funny thing is that we didn't find out until 2 days later when there was a random photo in the NY Times of the two of them walking through the front entrance! It was a wonderful day and we have so many wonderful memories of praying with the Holy Father and being with our fellow religious priests and lay brothers and sisters. Oh, yes, President Clinton and his wife were there, too. After Vespers the former President and his wife worked the crowds making sure to shake many hands. Former President Clinton reached to shake the hands of the sisters in one of the rows and a sister who will remain nameless didn't shake. She acted like she couldn't reach and instead tapped his hand! Later she told us, "My intention was to slap his hand!" Dominic: Light of the Church, Behind the Scenes!